A blogroll is a list of links that you display on your WordPress blog. You can add and manage the links in your blogroll. To view your default blogroll, click the Links menu on the Dashboard navigation menu. The Links page opens, and you see the default links already included in your WordPress blog. If you want to remove a link from your blogroll, select the box to the left of the link name; select Delete from the Bulk Actions drop-down menu at the top of the page, and click the Apply button. 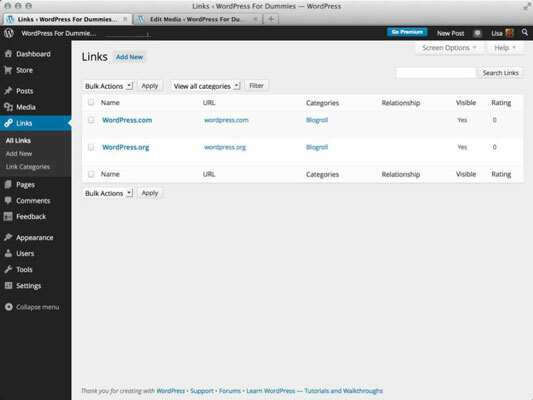 WordPress lets you have an unlimited number of link categories on your blog. Link categories, which function similarly to the post categories, allow you to separate your blogrolls (or list of links) into topical categories. By default, WordPress sets up a link category for you called — by no coincidence — Blogroll. To add a new Link Category, click the Link Categories link on the Links menu to open the Link Categories page on your Dashboard. You add a new link category the same way you add new post categories. To add a new link to your blogroll, click the Links subtab and then click the Add New link. The Add New Link page opens. In the Name text box, type the name of the website you’re adding. In the web Address text box, type the website’s URL, making sure to include thepart. (Optional) In the Description text box, type a short description of the website. In the Categories box, select the check box to the left of the category you want this link to appear in. (Optional) Select the target for your link in the Target box. The third option — None — is recommended. (Optional) Select the Link Relationship (XFN) option and define why you’re providing this link. XFN, or XHTML Friends Network, allows you to indicate the relationship you have with the people you are linking to by defining how you know, or are associated with, them. Table 4-1 lists the different relationships you can assign to your links. Identity Select this check box if the link is to a website you own. most closely identifies the relationship. linking to is a co-worker or colleague. describes your relationship with the person. select the option that tells how the person is related to you. closely identifies the romantic relationship, if any. Rel: Enter the link relationship in this text box. This adds a rel value to the hyperlink and allows you to style links based on the value. There are several link rel values you can use here — you can read more about rel values at W3schools.com. Image Address: This option associates an image with the link, and some WordPress themes display the image on your site along with the link. Type the URL for the image in the Image Address box. For this purpose, you need to know the direct URL to the image (for example, http://yourdomain.com/images/image.jpg). RSS Address: Type the RSS feed URL for the blog you are linking to. WordPress displays the link to the site’s RSS feed alongside the link that appears on your site. Not all WordPress themes accommodate this feature. Notes: Type your notes in the Notes box. These notes aren’t displayed on your site, so feel free to leave whatever notes you need to further define the details of this link. A month from now, you may not remember who this person is or why you linked to her, so you can add notes to remind yourself. Rating: Use the Rating drop-down menu to rate this link from 0 to 10, 0 being the worst and 10 being the best. Some WordPress themes display your blogroll in the order you rate your links, from best to worst. Scroll to the top of the page, and click the Add Link button. Your new link is saved and a blank Add New Link page opens, ready for you to add another new link to your blogroll(s). Additionally, in the Save section at the top right, you can choose to keep this link private; this option, if selected, keeps the link from being displayed publicly on your blog. The link would be kept protected and for your eyes only. Revisit the Manage Links page anytime you want to add a new link, edit an old link, or delete an existing link. You can create an unlimited amount of blogroll categories to sort your blogrolls by topics.